Miras exhibit many fascinating behaviors including cycle-to-cycle variations, and its rare that one star behaves much like another despite their physical similarities. Among this interesting class is a subclass of even more interesting stars -- Miras whose periods change over time. We are used to stars changing very little in fundamental ways; even wildly erratic stars (like cataclysmic variables) at least vary in a similar fashion even when those variations appear chaotic. But the Miras showing period changes are special -- something fundamentally different is going on with these stars, and as such they serve as a potential window into the inner workings of this important class of stars. In the April 2011 Variable Star of the Season we'll explore the fascinating group of Mira variables with period changes to learn more about what they are and what they're becoming. Any discussion of what Miras are should really start a few steps back with the idea of what a star is, and how they evolve over time. Stars are gaseous objects composed at birth of mostly hydrogen and helium. Their light is powered by the thermonuclear burning of hydrogen into helium in their deep interiors. Over time, the hydrogen in the core slowly gets used up, which results in a change in the visible properties of the star over very long time scales. Stellar evolution is the process by which a star lives out its life, a process that occurs over timescales of millions or billions of years. Evolution takes the star from the pre-main sequence of early gravitational contraction, the main sequence when core hydrogen burning occurs, the post-main sequence and red giant branches when the core turns off and hydrogen begins burning in a shell surrounding the core, and finally the final stages where even the shell burning sources run out of fuel, and the star finally dies. Stars undergo profound and rapid evolutionary changes when they run out of nuclear fuel, and the Mira stage is perhaps the most dramatic in a star's life. Mira variables lie on the asymptotic giant branch, located in the red, high-luminosity region of the Hertzsprung-Russell diagram (shown at left), and all stars with less than about 5-8 solar masses will wind up as AGB stars. Their innermost cores are inert, having converted all of their nuclear fuel from hydrogen to helium, and then from helium to carbon or oxygen. The deep interior is still dense and hot enough that any helium or hydrogen will undergo nuclear fusion, and this does indeed occur in shells around the core. The high luminosities of these stars comes from the energy of the outermost hydrogen-burning shell, which puffs up the outer layers of the star, expanding it to great size -- perhaps 1 AU or larger. Importantly, many of the changes that occur in AGB stars occur not in millions or billions of years, but in hundreds or thousands. Stars in this part of the HR diagram may undergo self-sustaining pulsations, and when they do, they have very long periods consistent with the great physical sizes of these stars. The Mira pulsations in particular can grow to incredible amplitudes. Some Miras have amplitudes over ten magnitudes -- an enormous change in optical luminosity per cycle, and on par (in the optical at least) with the changes that classical novae undergo. Unlike novae, these pulsations come about from the periodic contraction and expansion of the star's surface, along with changes in temperature. Both of these together change the brightness, but the temperature variations in particular can also change the dust concentration around the star, further amplifying the brightness variations at optical wavelengths. In the infrared, the amplitudes of Miras are not nearly as high both because the temperature changes of Miras during the pulsation cycle do not lead to infrared brightness changes as large as the optical ones, and because dust does not absorb infrared light as well. The large amplitudes of Miras and their ubiquity in the galaxy have made them some of the best- and longest-observed variable stars in our skies. They've long been targets of astronomers, both professional and amateur, since before the distinction between "amateur" and "professional" even existed in astronomy! As a result, there are many Mira variable light curves that extend far backwards in time, with some extending well into the 19th Century, and a rarer few extending even farther back. These long light curves present us with a unique opportunity -- to study stars not just as they are now, but how they have been in the past. They provide us with an opportunity to watch stars undergoing fundamental changes on timescales longer than a single human lifetime, allowing us to probe deeper questions of how stars evolve over time. A paper by Arthur Stanley Eddington and Stavros Plakidis in 1929, and further papers by Plakidis pursue both the period changes and the statistical analysis of period measurements themselves. 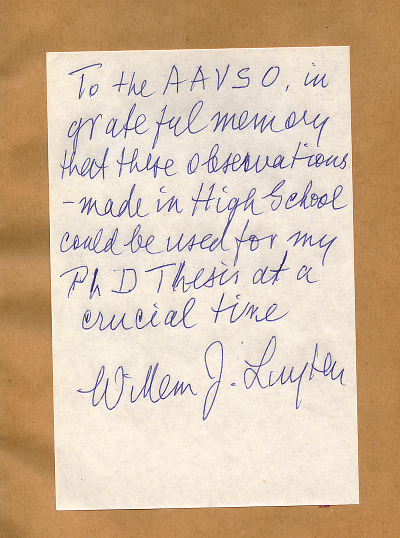 These were followed by a paper by Theodore Sterne and AAVSO Recorder Leon Campbell in the late 1930s that applied many of these ideas to the large store of data held by the AAVSO at Harvard. Sterne and Campbell's work (which included several stars that weren't Miras, like SS Cygni and RX Andromedae) provided a very rigorous statistical method to find period changes in a systematic way. It wasn't perfect, in part because some period changes only become obvious after many decades of watching, but it put the observational study of period changes on good footing. Observational data provides the building blocks from which we gain knowledge and understanding, but data alone can't provide everything. One important point is that interpretations of data have to be grounded in fundamental physics. When we try to understand what we see, we have to start by interpreting phenomena according to physical laws that we know and understand. A number of advancements in stellar astronomy occurred in the 20th century, not least being the eventual understanding that stars are powered by nuclear reactions in their cores. Another important point is that data alone sometimes can't tell the entire story -- either it's too difficult to observe the phenomenon, or the technology doesn't exist. That's especially true of stars because (a) we can't experiment with them, and (b) their fundamental evolutionary changes occur on timescales far too long to observe in a human lifetime, or even a thousand human lifetimes. One of the great advancements in understanding stars came about in the latter half of the 20th century not from observation, but because the newly invented digital computer allowed us to model stars, creating simplified structure models -- based on both observational data and fundamental physical priciples -- that we can run forward in time to understand what makes stars what they are. The mathematics of stellar structure was worked out much earlier in the 19th and 20th centuries, but the digital computer allows you to create much more sophisticated models of stars than you could build "on paper", and then to test how they'd change over time. 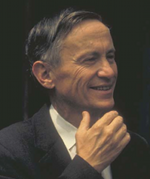 By the mid 1960s, the basic processes that drove the evolution of stars from pre-main sequence collapse through the red giant stage were being clarified through the use of computer models, and researchers were testing all manner of hypotheses and situations: stars of different masses, compositions, and ages were all fair game for computational modelers, so long as they had some basis in reality. As an example, in 1961, Richard Härm and Martin Schwarzschild (left) presented a paper detailing what happens in the core of an evolved red giant star with a helium core on the verge of nuclear burning. Their calculations indicated that burning would occur very rapidly, owing to the nature of the material under pressure deep inside the star. The result would be a "helium flash" during which a great deal of energy would be created inside the core, resulting in rapid changes in the structure of the star. Later, similar calculations suggested similar events might happen deep inside evolved stars with "shells" of hydrogen and helium turning on and off as the star grew older. As the power and speed of computers increased throughout the 1960s, 1970s, and 1980s, the complexity of stellar models increased as well, providing us with new understandings of stars, their formation and evolution, and even the age of the universe. But models provide only part of the picture, and in a sense, they have the opposite problem of observational data -- they may provide a detailed hypothesis, but without verification against reality, a model is simply a model. Validation for many aspects of stellar evolution theory came from studying things like coeval open clusters, where you could look at a number of stars with the same age but different mass. If your stellar model could predict properties like those you observed, that was a good sign your model was on track. Variable stars -- especially those that pulsated -- also provided good validation for computer models of stars, and the modeling of pulsating variables like Cepheids, RR Lyrae stars, and Miras blossomed in the 1960s and continues still today. The interiors of evolved stars like Miras are believed to be extreme -- their cores are the ultradense ashes of hydrogen left over from main sequence evolution, bearing more resemblance to burned out white dwarf stars than the normal stars they once were. Their envelopes are tenuous and cool, inflated by the nuclear burning that occurs on the fringes of the core, where unburned hydrogen and helium from the envelope meets the hot, dense boundary of the star's dead core. What is just as extreme is the rate at which changes occur. While a Sun-like star on the main sequence might take millions or billions of years to change percepibly, highly evolved stars of the asymptotic giant branch are predicted to evolve far more quickly, in thousands or hundreds of years -- perhaps even in decades. It is at this point where observation and theory have the most promising potential for overlap -- the most rapid evolutionary events in evolved stars occur on timescales that we now have data for, in the form of long-term variable star light curves. One early theoretical paper directly discussing our Variable Stars of the Season was by Peter Wood (right) and Dominic Zarro (1981) who compared the calculated changes in an AGB star during one of the thermal pulses described above to the changes in period that can occur in Mira variables. The period of a Mira is determined in part by the radius of the star along with other interior properties. So one might expect that during a thermal pulse, the size and interior structure of the star would change enough that they'd be observed either directly, or by their influence on the pulsation period of the star. Wood and Zarro pointed out that both R Hya and R Aql were two long-known stars with period changes, and also pointed out that W Draconis might be a third. Their calculations of how thermal pulses change stars matched to reasonable degree both the scale of the changes and the timescale for changes to occur. A number of other papers were published during the 1980s and 1990s by a number of different researchers, and there is good -- but not yet absolute! -- evidence that long-term period changes in Miras and other AGB stars can be caused by thermal pulses. Why do I say we're not absolutely sure? For one, it is difficult to prove that a single star is in the middle of a thermal pulse, since there aren't enough observational clues to prove conclusively that such changes are happening. For another, it is also possible that other physical processes might occur. Mira stars and AGB stars generally are incredibly complex. The entire envelope of the star is undergoing vigorous convection, and in Mira variables, the extremely tenuous envelope is also undergoing large amplitude pulsations. Furthermore, AGB stars have temperatures that lie on the borderline where atoms can easily form molecules, and where molecules can form dust grains. Processes like these can -- at least in the atmosphere of the star -- potentially produce enormous changes in the appearance of the star, and perhaps even in the interior. As an example, a 2004 paper by Albert Zijlstra suggests that for at least one star, BH Crucis, changes in pulsation period may be linked to observed changes in chemical composition, and feedback between atmospheric/photospheric changes and conditions in the deeper interior that control the pulsation behavior. 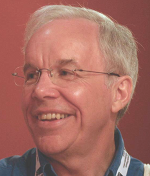 Peter Wood himself suggested in a 2010 paper that period changes might instead be due to sudden changes in the interior, for example a change in the number of convection cells. Stan Walker noted in his 2010 paper that the long-term behavior of BH Cru shows a discontinuity in both period and light curve shape, which would argue strongly against a thermal pulse. Period changes in Mira variables are by no means a solved problem despite their being known since the late 19th century. While our understanding of stars has become more sophisticated, so too has our understanding that we don't know everything. For this reason, the continued observation of Mira variables showing such phenomena is critically important, for researchers of today and tomorrow. This is why we need you to observe! Your observations of Mira variables with period changes will one day help us solve this problem; without the data, we'll never know for sure. In our 2005 paper, Templeton, Mattei, and Willson gave a review of the observational state of Miras with changing periods. 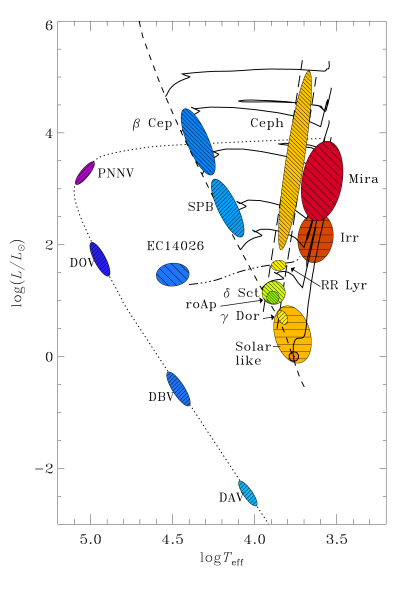 In that paper, we discussed the observational histories and behavior of eight Miras whose light curves showed very large period changes and had been discovered up to that point: T UMi, LX Cyg, R Aql, Z Tau, W Dra, R Cen, R Hya, and BH Cru. Of these, the most dramatic by far is T UMi, whose period began to change suddenly around 1970, and whose overall brightness has changed exactly as interior models would expect for a star undergoing a thermal pulse. T UMi first got serious notice starting around 1994, and it's clear now that a radical change has occurred since 1970 -- most importantly that T UMi is no longer a Mira variable! Its pulsations have dropped in amplitude and become so irregular that we're no longer issuing predictions for it. There's good evidence that the "irregularity" is really due to the presence of a newly activated second pulsation mode (also predicted by theory! ), but either way it is nearly impossible to predict T UMi's behavior cycle-to-cycle now. Some of the other candidate stars are probably similar objects to T UMi but may be in different stages of the event that caused them: R Aql, R Hya, Z Tau, and W Dra are likely undergoing the same process. The others, especially LX Cyg and BH Cru, might be some other phenomenon. Both BH Cru and LX Cyg share properties common with what Tim Bedding and Albert Zijlstra described in 2002 as "meandering Miras" -- long-period Miras whose periods change by 10 percent on timescales of decades, but show cyclical rather than monotonic changes. The idea is that long-term changes in the star are triggered by some more transient change, as in the chemical equilibrium of the envelope, or a change in pulsation caused by chaos. 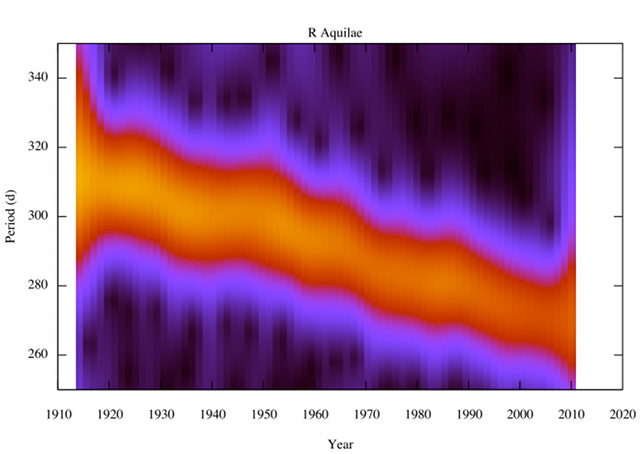 Zijlstra and Bedding even suggest that all period changes -- including long-term monotonic changes like R Hydrae -- could be caused by these processes. Certainly BH Cru points toward some other explanation. There is no consensus as to the cause of these period changes; that will only come about through more and longer-term observation, and more detailed modeling, both of which take time. Table 1 from Templeton, Mattei, and Willson (PDF) provides a list of "most-wanted" stars -- those showing some of the most dramatic changes. It's almost certain that thermal pulses don't explain period changes in all of these stars. In fact, a number of these stars show only weak evidence for period changes that could easily be due to random variations in period. But a thorough study of the stars in both observational and theoretical fields will yield much new information about Mira variables, the asymptotic giant branch, and the ends of the lives of stars in general. Part of that study -- the collection of observations over time -- is, in part, up to you. The Mira variables are among some of the best-observed stars in the AAVSO archives, and the historical records for some of these stars span well over a century. Such records are the only way we can detect the sort of behavior that we see in the Miras showing period changes, as well as all of the other long-term behaviors that we see in variable stars of many types. The astrophysical knowledge we gain about the late stages of stellar evolution is very valuable, and these rare stars with large period changes provide even more critical information about the rapid changes stars can undergo. If thermal pulses are responsible for large period changes, then it is likely that all the Mira variables of today will undergo changes like the ones we see in T UMi and the other period-changers. Whether it's ten thousand years from now or next week, we have no way of knowing. But we do know that we won't see these changes occur if we don't keep looking. And if there's a different mechanism than thermal pulses in these stars, then we clearly have even more work to do, and observations will be just as valuable. Variable star observers like you have been gathering the data needed to study these phenomena for well over a century now, and it will be the variable star observers who continue to extend and improve these light curves into the future. These data -- particularly the visual data -- provide a long and detailed historical record for these stars that will give astrophysicists what they need to better understand the changes that occur in stars over time, and the only guaranteed source of such observations has been the amateur community. As of today, there is no guaranteed source of data from any robotic observatory or monitoring project where the data can be seamlessly merged with the existing data archives. It is precisely because the visual archives are so long that we're able to detect long-term changes in these stars. If observers like you keep looking, it will be the amateur data that reveals the next star undergoing similar changes. If there is any star or class of variables that motivates continued amateur variable star observation, these are it. Name Range Period RA Decl. A number of these stars are in our skies right now: T Ursae Minoris in the northern hemisphere, and R Centauri, BH Crucis, and R Hydrae in the southern. More will come into easy view by the middle of the year including LX Cygni, W Draconis, and R Aquilae. If you're a visual observer looking for interesting and valuable targets, these are excellent ones. Right now the visual data provide the longest and most reliable sets of data for these stars in existence, and your data will be used to study period changes in these stars well into the future. The April 2011 Variable Star of the Season was prepared by Dr. Matthew Templeton. He is partially supported by National Science Foundation grant AST-1009395.